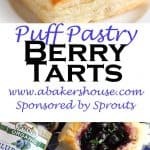 Puff pastry berry tarts are a cinch to make. It’s no secret that I like to bake and baking from scratch has its time and place, BUT I love a shortcut just as much as any home baker! Shortcuts abound while making these easy tarts using ingredients from #Sprouts. 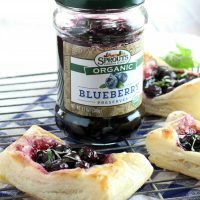 A puff pastry base serves as the canvas for these Berry Tarts which highlight Sprouts Organic Preserves and fresh berries from their produce department. The preserves offer a variety of options: strawberry, blueberry and apricot caught my eye. I’m sharing two versions here– Blueberry with Mint and Strawberry with Basil. I’d also suggest an alternative filling in this recipe for wojapi, an American Indian berry sauce. For a bare-basic tart simply use the preserves on their own, no fresh berry topping required, or try them with a mixture of herbs and preserves topped with a few blueberries, strawberries or other fruits like peaches or plums. The way the puff pastry rises around the filling and turns a golden-brown will make you look like a seasoned pastry chef! 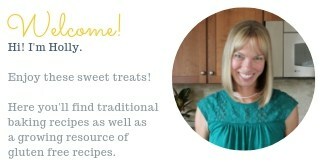 Check out more recipes and tips at Sprouts Brand website for summertime favorites. Many thanks to Sprouts for sponsoring this post. All opinions are my own. Lightly flour a work surface and the puff pastry. Gently use a rolling pin to roll out the puff pastry to smooth over the creases. Cut the dough into 12 portions (3 columns by 4 rows) then place on a parchment lined baking pan. Prick the center of each portion of dough with a fork a few times to prevent the middle from rising too much. Whisk the egg and water together to make the egg wash. Brush the egg wash around the edges of each rectangle of dough. 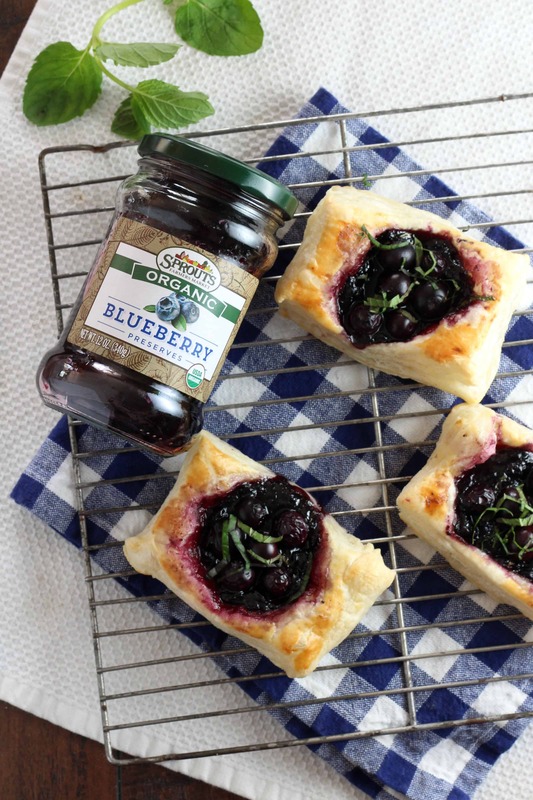 Spread 1 tsp of Sprouts Organic Blueberry Preserves in the middle of each rectangle. Top each with 1/2 tsp of finely chopped herbs and 5-6 blueberries. Bake for 18-20 minutes or until puff pastry is golden. Cool for 5 minutes then serve. Try different fillings-- there are plenty of options! This nutrition information was provided by Nutritionix and is an estimate only. 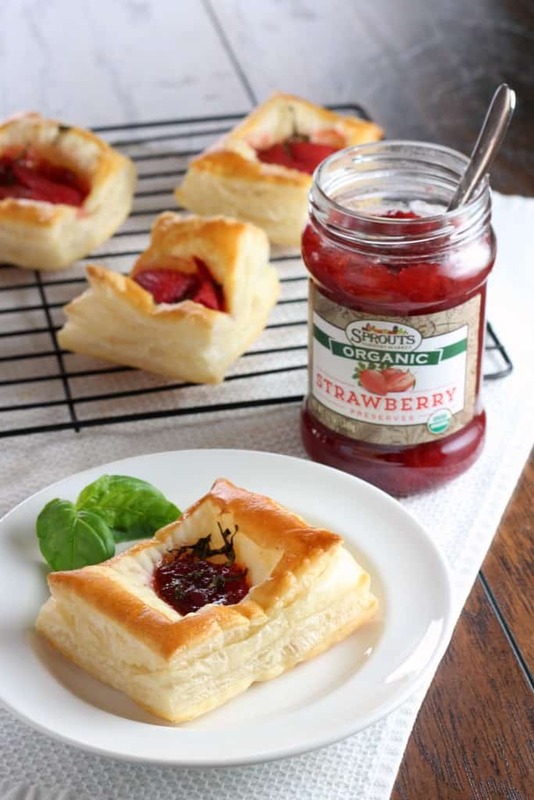 I love to buy puff pastry squares and fill them with fresh fruit or jam for Sunday morning turnovers. Yours are a nice new twist on that old idea. They look delicious.